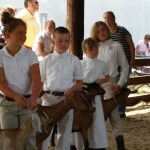 We have made the decision to sell our herd of Lamanchas and focus only on the horses on our farm. We are not happy dividing our time and have been skirting this decision for a while. 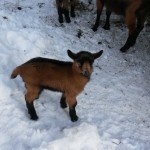 Our entire herd is for sale, along with all our goat specific supplies. The first half of the herd was sold today. 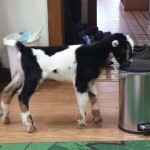 It is a bittersweet end to our goat farming. 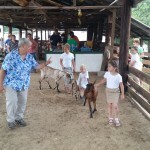 We have enjoyed our animals and learned a lot about husbandry and farming in general. 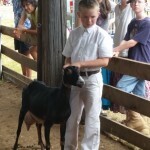 Our experience will encourage us to support other farms. 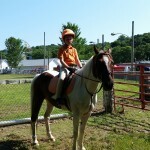 However, we are ready to move on and enjoy our horses. 3. 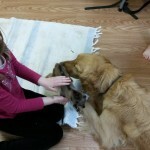 Already trained and able to be used in Anna’s lesson program. 4. Young enough to have some go and be fun for Rob on the trails. 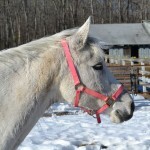 So, today we brought home a 15hh, 9yo Arabian mare (Shagya bloodlines) that is still pretty green. But in our defense, Anna has wanted an Arab (but prefers geldings) and I am interested in limited distance endurance riding. 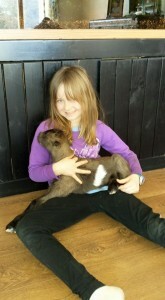 Introducing Sophie (pending a name change!) 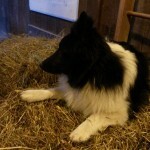 Sophie will be a training project for this year. 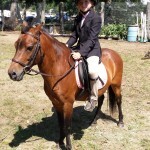 Anna will focus on her dressage foundation and Rob will focus on her trail and ground work. We plan to divide up the work on Dakota in a similar fashion. The bottom line is, horses will continue to be our main focus. 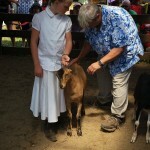 Backing up a few days, on Tuesday, Sawyer Farm’s Onyx kidded and gave us a cute little buckling named Sawyer Farm’s Smores. 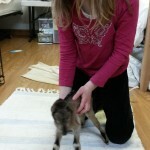 Smores is being raised as a bottle baby and will hopefully find a home for use in breeding. 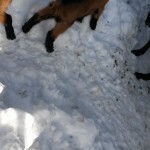 On Friday, we got another round of snow (about 3″ at our house) and triplets, 2 does and buck, from Longvu Bx Tangueray Texter (Tang). Sawyer Farm’s Three Musketeers was the buck and the larger doe, Sawyer Farm’s Kit Kat is already reserved and will be leaving next week. 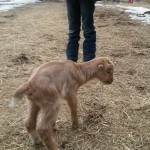 Sawyer Farm’s Twix was the runt at 4.6 lbs and will be raised by Vicki. We only bred 1 other doe this year, but it appears she didn’t actually get pregnant, so we think that wraps up our kidding season. Final tally – 4 does and 2 bucks. 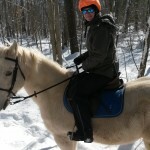 Now as soon as the snow finishes melting, we can saddle up the horses! Last night, I had an unexplained allergic reaction that resulted in a short trip to the ER. As a result of being up until 2am and the meds making me so drowsy, I went to work for only a few minutes and then to see the Dr’s. I got some more meds and came home for rest. 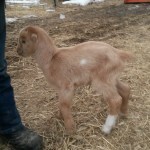 Around noon, Anna woke me and informed me West View Swan’s Saffron was kidding. I joined Anna and Vicki for the event in the kidding stall. 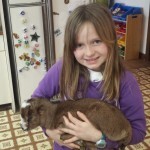 Saffron is a 4th freshener 5 year old who gave 11-12 lbs of milk a day last year. This is an udder that has “popped” meaning looks like 14 hours since it has been milked and is stretched tight. Don’t milk her, just get your kidding supplies by the back door, because it means you won’t be waiting long. 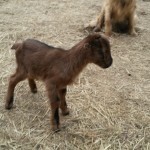 For Saffron, imminent signs of kidding included lots of pawing, grunting, visible contractions for about 40 min, and then baby goats. We are raising all the kids as bottle babies this year. 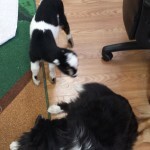 Since Anna doesn’t want to trek back and forth to the barn all day and night, they are in the office in a dog crate starting out. 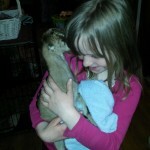 Saffron gave us 2 doe kids: the dark one is Sawyer Farm’s Milky Way and the light one is Sawyer Farm’s Caramel. It appears this year’s name theme will be candy. Here is Vicki holding Milky Way. 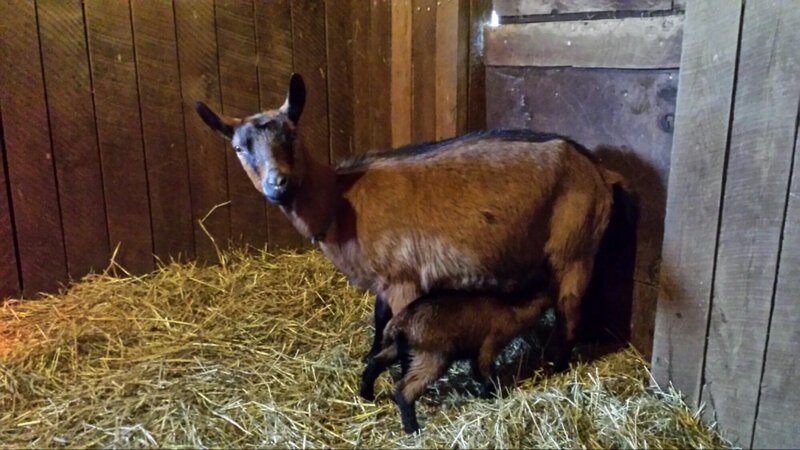 She is very excited to have babies to bottle feed again. 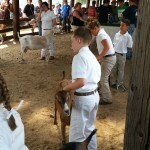 It was an exhausting weekend as we kicked off the 2014 fair season with the North Stonington Fair. 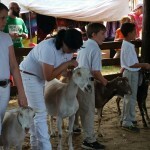 Thursday, 8 rabbits reported for show duty and spent the weekend looking pretty for the masses. 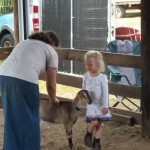 Friday, Anna and the kids spent the day washing goats, washing horses, and Anna was up past midnight braiding manes. 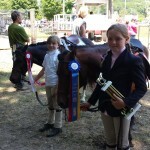 Saturday morning, we loaded the trailer and headed to the horse show. 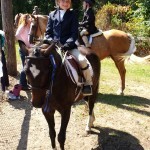 Amanda rode on Huey in the lead line class. 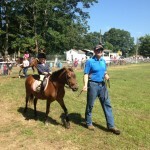 Jack, one of Anna’s students, also rode lead line on Devil. 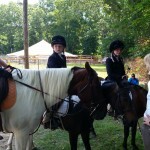 Vicki rode Devil in the walk-trot classes along with her best friend, Alexis, who was on Huey. 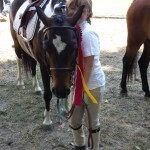 Alexis actually beat Vicki for the walk-trot championship (in her first show ever). It does Vicki good to get taken down a peg every now and then. 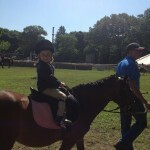 Alex has no interest in the ride around the arena classes, however, he was keen to ride in the Gymkhana classes. 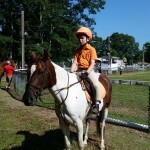 He did the mounted games at the 4-H show in May with Dakota, so we let him do it again, only this time, we let him canter Dakota. He did come close to the fastest times, but he maintained control and had fun doing it. 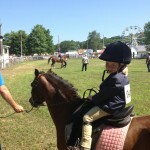 He even decided to add-on a 1 walk-trot-canter class for the day. 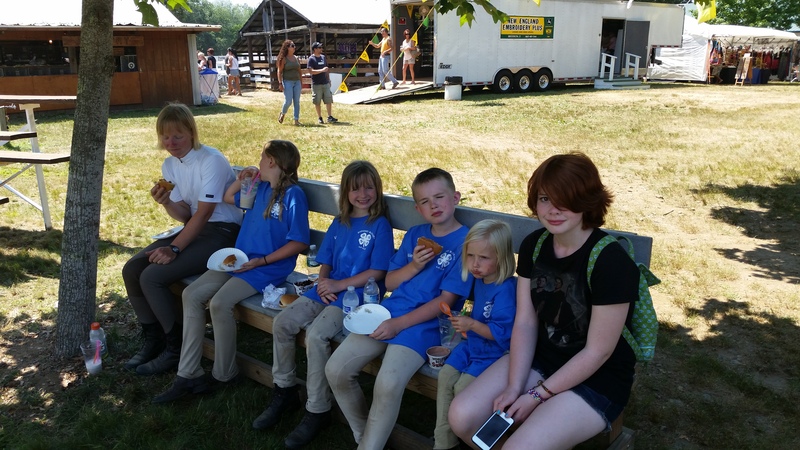 After the horse show, the kids put on their new Barnyard Buddies 4-H shirts to walk around a few minutes, but needed a food and drink break. Ruth is another one of Anna’s students who came along for the day to watch Amanda, but seemed to get bitten by the show bug and is talking about getting more serious in her plans with King. Sunday was the goat show. 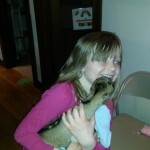 We had 11 goats with 5 kids (Alex, Vicki, Amanda, Alexis, and Selena) our herd. 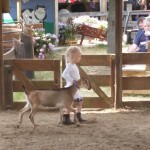 Amanda got to show Sprout in Pee-Wee showmanship and the Pet class. 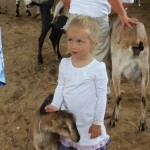 Another long day, but everyone had a good time and Alex is actually starting to get more into the goats. 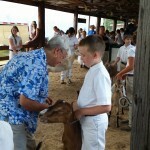 Sawyer Farm’s Onyx won Best Jr Lamancha and Sawyer Farm’s Sequoia won best Jr Recorded Grade. 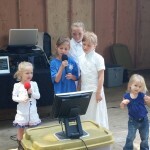 Throughout the afternoon, WCTY was doing karaoke next to the goat show, and the kids were constantly on stage giving it a try. 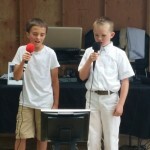 Amanda and her friend Lily spent almost all afternoon on stage. 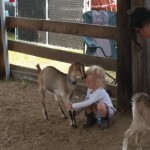 2 weeks until the next fair! This afternoon as I was working outside, I heard screaming coming from the barn. It was Anna yelling “Rob! Rob! 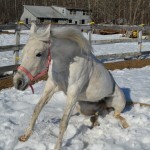 Rob!” I assumed she found a snake sunning in the spring sunshine, but since she had just finished riding King and was in the barn with him, it could have been something more serious, so I trotted over. 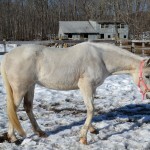 She had Frosty (West View Frosted Love) coming down the aisle of the barn, with Onyx following and King in cross ties. Maybe the goats got through the fence? It turns out Frosty was in labor. 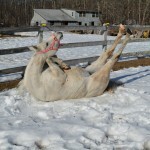 Frosty didn’t settle right away last fall, so we let her live with Apache for a while. Therefore, we were not exactly sure of the breeding date. I guess now we know it was 5 months ago from today. 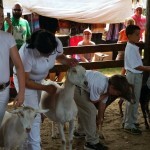 So, we parked Frosty in the kidding stall, caught Oynx and put her back out with the other goats, and turned out King. Then we went about the other projects planned for the afternoon. Checking on Frosty later, we saw she was actually in delivery, but when we stepped into the kidding stall, we discovered the first kid was already out and on the ground. 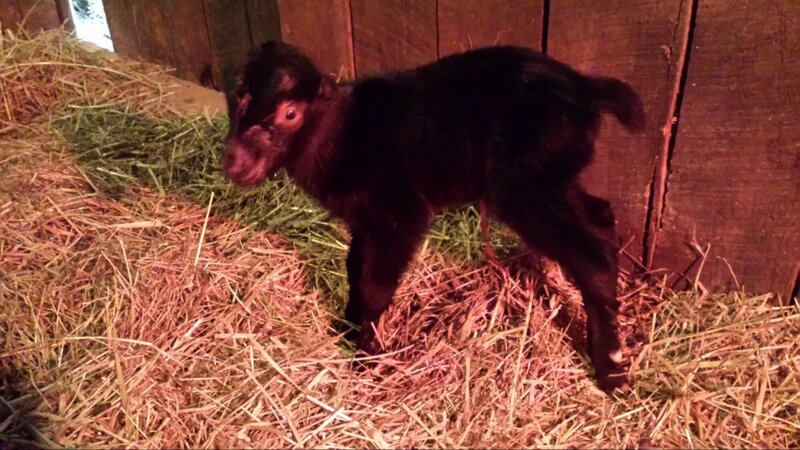 It was a tiny little buckling that weighed in at 2.5 lbs. 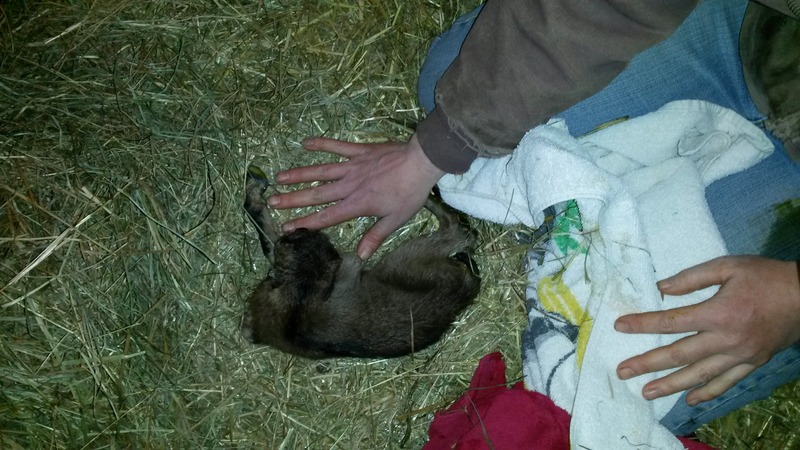 That is Anna’s hand for size comparison. 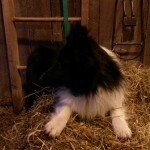 Anna and Vicki left for dog training with Turbo. Luckily, Frosty kids easily and didn’t need help. 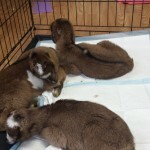 She had 2 more bucklings, each weighing in a 5 lbs. 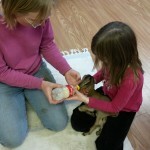 Since the runt wasn’t standing as fast as his brothers and would likely get less teat time, against my objections, Vicki and Anna decided to move him inside and make him a bottle baby. Apparently they are of the opinion we are keeping him. I’m not convinced, but I have a feeling I will lose on that discussion too. 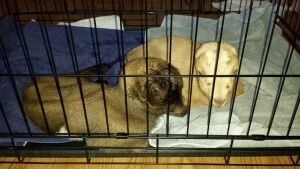 So, for now, Hazelnut is living in a dog crate in the house. Mack doesn’t seem to care. Vicki and Amanda are excited – for now. 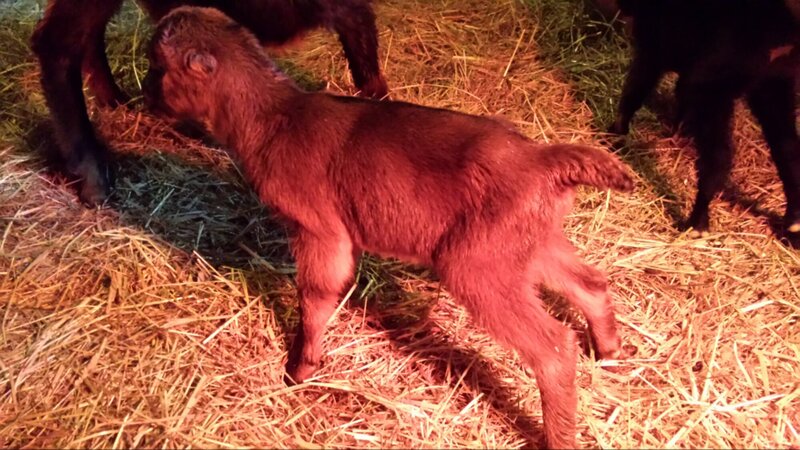 Final tally for kidding season: 6 goats freshened giving us 1 single, 4 twins, and 1 triplet with 8 bucklings and 4 doelings. This morning as I went about my chores I let Pocohontas out of the kidding stall noting that her udder looked bigger than last year and bigger than yesterday. Considering she was a week overdue I felt that was good news. I fed her, noted her ligaments were pretty loose and that udder pretty tight so I stuck her back in the kidding stall making a mental note to check on her after finishing the other chores. Since I spent Saturday tired after checking on her all night Friday-Saturday, I wasn’t getting excited. Maybe just another false alarm. So I went about my chores. 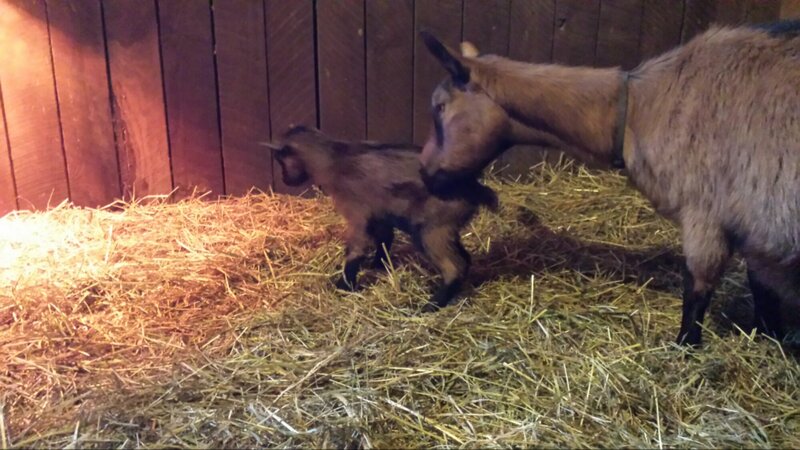 An hour later as I passed by the stall I heard little goat kid squeaks in there and was surprised to find two new babies! 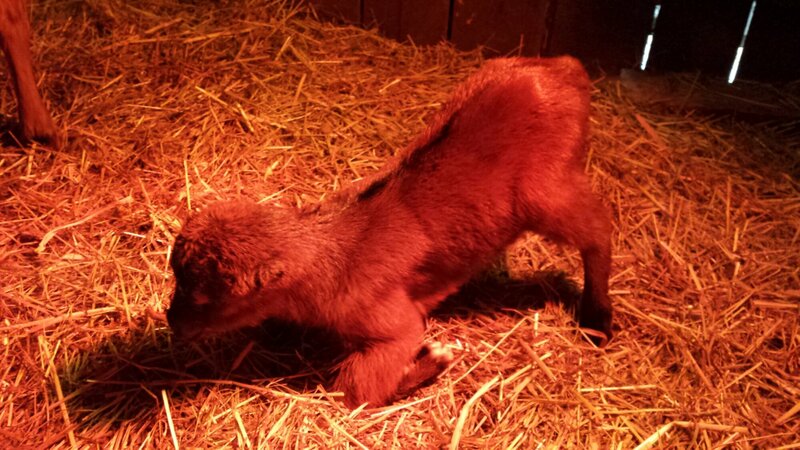 Poco had two bucklings and they are strong and both up and nursing shortly after birth. 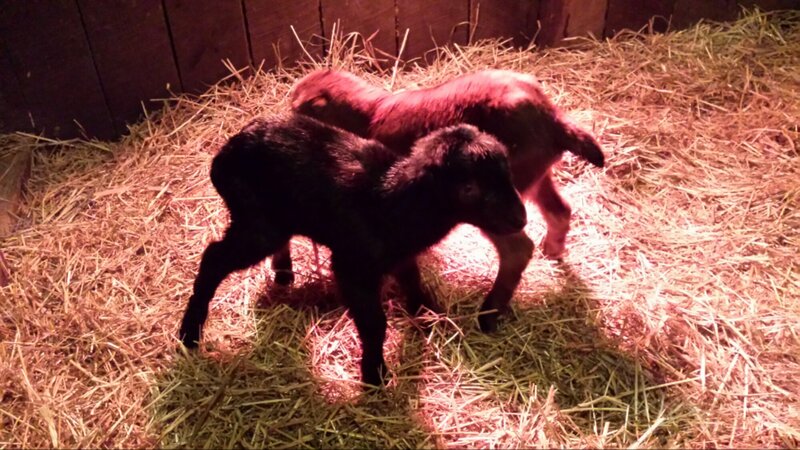 Amanda and I named them Chestnut (the red one) and Black Walnut (black one). Last night, Anna went to bed as I stayed up working on some things (ok, I was on Facebook). 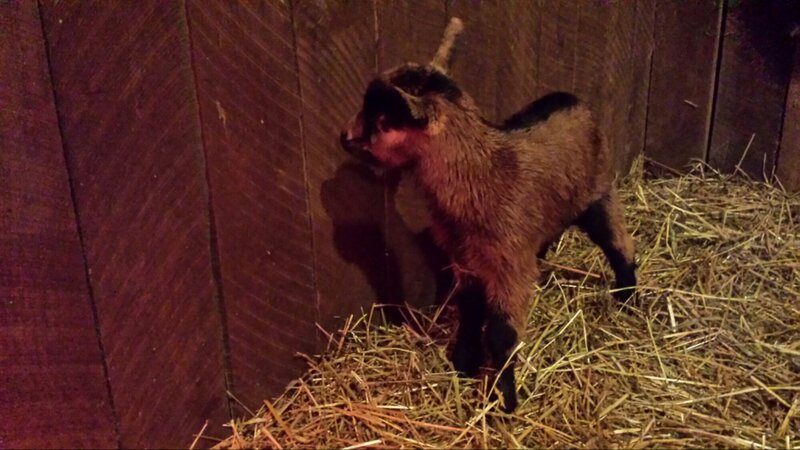 Around 11, I was ready for bed, but first went to the barn to check on West View Swan’s Saffron, one of our Lamancha does, who was in the kidding stall for the night since she was already 2 days overdue. I discovered she was in labor. 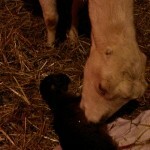 I headed back in and woke Anna to tell her I was getting more warm clothes and heading back out to the barn since Saffron was in labor. She thought I should get a couple of hours of rest first and then go out around 1. I didn’t think so. 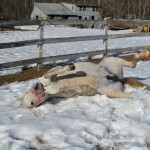 As she drifted off to sleep, I headed back to the barn. When I arrived, the first kid was already on the ground. 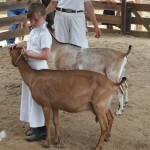 She was a long legged doeling that looks a lot like her sire, Blue-Ridge Apache and weighed in at 6.6lbs. Her brother followed not too long after and weighed in at 6.9lbs, and has the look of his mother. Both started with wobbly legs, but by this afternoon, they were getting around a little better, so we took them out for some quick photos. 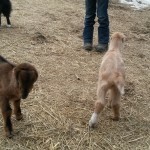 Introducing Sawyer Farm’s Sassafras (dark colored doe) and Sawyer Farm’s Birch (light colored buck). Turbo, our Sheltie, was watching over the photo shoot. 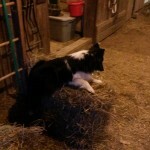 After we finished, he went back in the barn and hopped up on a bale of hay to take a break. 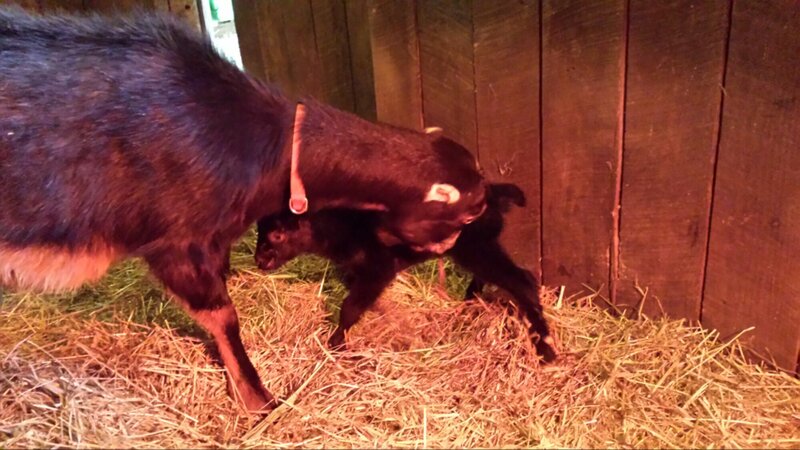 West View Magnolia gave birth to a 9.8lb doling today. 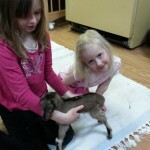 We were expecting more kids based on how big Maggie was, but we are happy with a big health doeling. 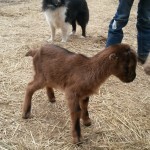 Introducing Sawyer Farm’s Sequoia! 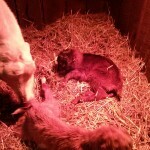 It turns out Sequoia’s sister from last year, Sawyer Farm’s Diamond, was also born on March 2nd! 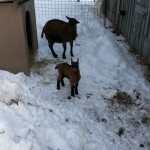 Last night, we got another 5″ or so of fresh snow dumped on the farm. After clearing the driveway (again), clearing paths to/from the barn (again), breaking ice (again), and finishing morning chores, we came in for coffee. 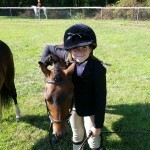 We were originally scheduled to trailer ponies to a pony club games practice, but it was cancelled. So, Anna and I decided to call the next door neighbor for some babysitting after lunch. 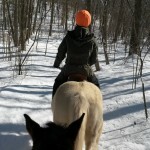 We saddled up King and Calli and headed out for a trail ride. There was over a foot of snow on the trails. Mack got to come along, but Turbo stayed home. We did encounter fresh snow mobile tracks, but no actual machines and no people. We got to work on Calli and crossing icy water. We will need to continue to build this skill. 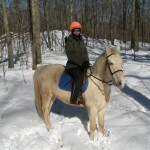 We spent an hour on the trails, and even though we only walked, I think the horses got a pretty good workout trudging through the winter wonder land. 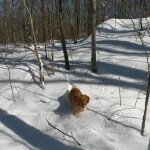 Lucy also got to venture out into the snow with her kids, Red Maple and Oak.